I grew up in a house full of girls, except, of course, my dad. Even our dog was a girl. Because of this, I was pretty shy when it came to boys. That's me and my two sisters. I was 18, Tammy was 14 and Tracey was 10. I got married at the age of 23, and about five years later, we started our family; three boys and a girl. I would have never had believed that I would have a house full of boys. It has been a joy to have a house full of men...handsome men at that. I am a very lucky woman to be surrounded by such wonderful, handsome men. Well, she is finally gone; and No mishaps on the paint. Boy, am I glad. Won't have to worry about painting this room for awhile; I can worry about some other room that needs it worse. I am the oldest grandchild on my mother's side. I didn't get to spend as much time with my grandparents or extended family as many of you probably do. Growing up in Florida and all my relatives living in Colorado made it difficult to do so. I count our family lucky, though, because we were able to go visit them almost every summer. I also feel lucky because my parents made sure we did not feel as strangers to our grandparents, aunts, uncles and cousins. We still felt very close to them, even though we lived so far away. I remember my grandmother very well. I feel very privileged to be named after her; we both share the same middle name, Jeanette. Grandma loved to cook, and she was one of the best bakers I know. She also liked to do other crafts including sewing. When Bill and I got married, Grandma gave us a very special gift. She had put together, by hand, a very nice quilt. She even signed and dated it. I have to be honest, very few times have I used it on our bed. You see, I didn't want to mess it up. We have moved around a lot, and in some of the homes we lived I had a place to display it. In our most recent place, it now is one of the first things you see as you entry our front door. Not sure it will stay during the summer, as the sun shines right in the front windows and right on the area I have the quilt now; so I will probably have to put it up. But for now, it is where everyone who comes through our front door can enjoy it...including me. Saturday was a pretty nice day. The sun was out and it wasn't that cold. Still needed a coat, but I didn't freeze. Bill and I had some running around to do, and after we got home and put all our groceries and stuff away, we took it easy. I had some laundry to do, but for the most part, we just sat around and watched a little TV. I was messing around with my camera and pictures, and noticed Bill disappeared. I quietly went around the house looking for him, and noticed a light on upstairs. So, I tiptoed up the steps, and there he was, doing one of his favorite things; reading a book. As I sat at the top of the stairs, I noticed I was being watched. Soon, Sox came up and joined me. We just laid there for a few minutes enjoying the silence. You know, sometimes I really do miss all the commotion that use to be in our home. When we had four little ones running around; from top to bottom there were six years. Ya....silence is golden, but so are the sounds of happy little children. About three weeks ago, I went to the doctor to get established as a new patient. Last time we relocated, I didn't establish a family doctor until I was in the hospital with blood clots. A lot of the medical personal at the hospital really got on to my case about that. I don't normally go to the doctor unless I am sick. It was kinda funny going to see this new doctor. I felt as if they were puzzled as to why I was coming in. Anyway, my new doctor took a fasting blood work up. Everything except my cholesterol seemed to be fine. It was 205! Yikes! Wasn't that long ago when it was in the 130's. Recently, I had been eating eggs, not a whole lot. Since I've started exercising, I felt I needed more protein before I left in the mornings for the gym. I would have ONE egg, with one piece of whole wheat toast NO butter. Today, our local hospital was having a health screening I decided to go and get my cholesterol taken. My blood pressure was up, it usually is when I know I am going to be stuck. Also, I felt kind of jittery since I was fasting and I have a tendency to be hypoglycemic. It was not too high though. My glucose was 63. Not surprised. Then I waited to be called for my cholesterol. By then time I got in to get stuck again, I was about to pass out. BUT!!! I made it. Then I saw the numbers 215?!!!!!!!!!!! WHAT?!!! I have not had ONE egg in about three weeks, not even in a cake or cookie, etc. What is going on? Well, it is back to the eggs for breakfast. Seems when I have eggs, my weight goes down. When I cut them out, my weight has been creeping back up again. I don't really understand what is going on with my cholesterol. I DO NOT want to take statins. I tend to have leg cramps anyway (even though I drink only water, and plenty of it, AND and a banana everyday.) One of the side affects for statins are leg cramps. I guess this is one more thing to talk to my doctor about Monday when I go see him. Will be interesting to see what he says. By the way, this goes to show you that eggs are NOT necessarily the culprit when it comes to high cholesterol. Everyone keeps telling me that it is all genetic. I KNOW that! Here's the thing....my dad has LOW and my mom has high cholesterol. As I said before, I have always had very LOW; that is until I hit 40. Then it jumped form 130ish to 160ish. Slowly it has been creeping up. Two years ago it went form the 160ish to 180ish, and I asked my doctor about that. She was not concerned. She told me not to worry because it is under 200. Well, now that it is OVER 200....everyone seems to be having heart failure. In my opinion, something needs to be done about our crappy food. Even our raw fruits and veggies are not good for us anymore. There are too many extra things they put in them to make them look pretty or last longer. This has got to stop, because it is affecting our health. I have set myself a new goal! Yesterday I was at the pool and met a really nice lady (Bonnie). She is one of several that swim daily at our YMCA. In addition to my Pilates, Yoga, TRX, Water Aerobics, Water Walking, and Zumba, I like to swim. I've been playing around with trying to figure out my routine. After talking to Bonnie, I think I finally came up with it. She reminded me that 36 laps, makes a mile. By the way, for those of you who don't realized this, but a lap is up AND back. I started swimming back in November. I was sooooo out of shape when I first came to the pool. After an hour of Pilates then an hour of water aerobics, I would swim about five laps, and boy was a exhausted! I am up to 18 laps, which is 1/2 mile! I hope to be at a full mile by the end of the summer. If it wasn't for the fact that I will be doing a lot of traveling this summer, I feel I could possibly reach that goal much sooner, but I'm being realistic. Besides, when I swim, I have usually done some sort of exercise class before. Hopefully with that and eating properly, maybe I'll loose a little more weight. That's another one of my goals. At least I've lost 10 to 15 lbs since September. You ask 10 to 15? Well, it all depends on what day we are talking. My weight fluctuates; A LOT!!!! Since I have hypoglycemia, I have to be careful when it comes it eating. In other words, I need a good breakfast before I got to the gym. I was eating a couple of eggs with whole wheat toast about three times a week. Recently I had my cholesterol checked and it had gone WAY up, so I have cut out ALL eggs. Saturday, I get it rechecked. I think I've figured out what I'm going to do about my breakfast and lunch. Monday, since it is a light exercise day, I think I'm just going to have a piece of whole wheat toast, 1 tablespoon chunky peanut butter, 1 teaspoon honey, 1/2 banana and sprinkle cinnamon on top. For lunch that day, I'll have a green smoothie. Tuesdays and Thursdays I'm going to have an egg and whole wheat toast, no butter. Wednesday and Friday, the same as Monday, but in between my pool workout and Yoga, I'll have to have a green smoothie, then something light for lunch. Yoga is at noon, so lunch won't be til after 1:30. Anyway, I think I'll start this next week....wish me luck!!!!!!!!!! Our local extension office has a stitching group I've been going to for the last few months. Most of the ladies knit and crochet. Some do a little cross stitching. I crochet, I CANNOT knit (lol), and I've done a little cross stitching. The main reason I joined the club is because a friend of mine saw my crochet wire necklaces and since I was new in town, invited me to the group. I am so glad she did, because I have met some wonderful ladies. A couple of months ago, it was announced that our club was eligible to enter some of our crafts into a contest. Anything from photography, jewelry, knitting, etc. was allowed. I've been trying to figure out what I wanted to enter and finally narrowed it down to nine entries. For the most part I was pleased with the outcome. My photography didn't do very well, and I was a little disappointed. I got third place for my black and white entry. But my color entry got nothing. Seeing what was entered, I think I know now what they were looking for. I'll be ready next year. I can't show you this piece, as it is part of the Bead Soup Blog Party that I will be revealing April 6. I can tell you that it got second place in it's category (beaded jewelry). I can't show you this piece either for the same reason, but it placed third under Jewelry, Mixed Media. This piece got third place in it's category. Remember this? Well, it got second place under Recycled. This is what I started with. I recycled a pop top from a can and old telephone wire. This is another Bead Soup, and it got first place! I can't tell you what category, because it will ruin the surprise. Using these beads that Tammie, my Bead Soup partner made, I placed first it the category with the piece I made. Again, can't tell you what that category is....it will ruin the surprise on April 6. This is a decoupage piece I decided to throw in at the last minute. It actually got first place in it's category. Thought I'd make a necklace in the Mardi Gras colors. I am excited to say, I am done with my bead soup. Yes, I finished all my pieces, and I was able to come up with quite a few. Why the hurry? Well, last week, I had a procedure that I had to get ready for. One day I stayed home and was on a liquid diet. The next day I had the procedure. I had to have something to do, so I worked on my soup. The reveal date is April 6; we have a long time to wait to see the finished pieces. I will say this, I did use almost every thing I was sent. I have only a few odd beads left. Of course, I added in some from my own stash of beads. This week, I will be heading to a homemaker contest where I will enter several of my jewelry pieces and photography. Not sure how they will do, but if they win, they will go on to a state. One category is something made with recycled material. I can show you what I came up with since it is NOT part of the soup. I've already blogged about it, so you can click here, and see what it looked like before. Well, wish me luck! I graduated from Cocoa High School, Cocoa, Florida, in 1977. A few weeks later, my family and I took a long trip around the Western United States. One place we went was Temple Square in Salt Lake City, Utah. I was very impressed with the church, and for the next year and a half, I continued to learn more about it. Once we got back from our trip, I worked and attended the local community college. I really didn't know what I wanted to do, so I just took general education classes. 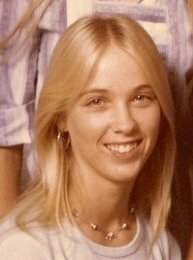 Then, April of 1978, one of my good friends from high school (we will call her Beth) came back from college for the summer. She had been the only Mormon in our high school, and had gone all the way out to Idaho to a church college. For the next six weeks, we hung out a lot going to the beach, etc. She spoke of her wonderful time at Rick's College. Between all the good things she had to say about Rick's and my interest in the church, I soon knew that I wanted to check this school out. In June, 1978, our family went to Colorado to visit with my grandparents and extended family. Since we were only a days drive from Rick's College, we decided to check it out. While on campus, I felt something I'd never felt before. It felt good. My parents agreed, and when we got home, I immediately started to apply for Rick's College. A few weeks later, I was accepted. Everything went so quickly, I couldn't believe it! Then, I had a few minor medical issues I had to take care of and was unable to attend the fall semester. January, 1979, after a very warm Christmas in Florida, Beth and I headed to Rexburg, Idaho, home of Rick's College. The first few weeks took some getting use to, as I saw 48 BELOW temperatures. The amount of snow was incredible. Nothing I'd ever imagined, let alone seen before. But, I loved it there. Yes! I loved the people, the atmosphere, and the Spirit; the Spirit of Rick's, as everyone referred to it. To make a long story short....January 31, 1979, I was baptized a member of The Church Of Jesus Christ of Latter Day Saints. I have never regretted that decision, and am grateful everyday for the opportunity I have had to learn and know about the Gospel of Jesus Christ. I am also grateful that I had the privilege to attend Rick's College. The experiences I had at Rick's helped me to grow beyond anything I every thought possible. Today, Rick's College is known as Brigham Young University-Idaho, or BYU-I. Our youngest son is a freshman in the engineering program. He is doing very well, and has made a lot of new friends. Before we took Benjamin out to Idaho, I wondered if the Spirit of Rick's was still there. My husband, who is also a Rick's College graduate, and I had not been to Rexburg is almost 25 years. When I stepped on campus for the first time in many years, I could still feel the wonderful feeling I had so long ago. Much has changed since we were students, as the campus has grown a lot! Instead of a two year college that fed into Brigham Young University in Provo, Utah, it is now a four year university! BYU-I offers approximately 18 associate and 70 bachelor degrees. There are so many wonderful things that go on at BYU-I. I don't have the room to talk about all of them. If you want more information, just swing on over to byui.edu or you can wikipedia Byu-Idaho. I know a lot of you don't like wikipedia, but it has some pretty intersting things to say about the college over there. 3. Connecting with local alumni and friends of the university." It is our hope that we can help anyone who may have questions about the university. It is a great place to get a superior education! So, if you have any questions, ask away. If we can't answer them, we will try to do our best to find it. Did you know that BYU-I has a student body of about 15,000 students from all 50 states and over 60 countries? There are some other interesting facts you can find if you click here. That is a good question for many people right now. For me? I will still cruise. My husband and I took our first cruise in May of 2003 to celebrate our 20th wedding anniversary. Growing up in the Port Canaveral, Florida area, I saw cruise ships going in and out of the port for several years. We had talked of going on one for our honeymoon, but since we were poor students, going to school several thousand miles away, we figured we would put the cruise on hold. Since we got married in Washington DC, and had two receptions, one in Florida and one in Nashville, Tennessee, we just honeymooned here and there until we got back to Provo, Utah where we were attending school. Anyway...back to cruising. I feel very bad about those who had an awful experience on Carnival's cruise ship Triumph. I don't think I would wish that on my worse enemy. I will say, though, that things happen. Planes fall from the sky, cars crash into each other, and cruise ships have their problems too. So many of the Trumph passengers repeated many times how the crew was, "Wonderful". They also mention that it was management that fell on their duty. My question is....what were they to do? I had wondered why they didn't just evacuate? After all, they use tenders all the time for shore excursions. After listening to CNN for awhile, I learned that the seas were not conducive to evacuating all those people. At first I questioned that, but then when I saw them taking a woman off the ship, I quickly saw that trying to get over 4,000 people off the ship (including babies, small children, elderly, etc. ), could be a bit on the dangerous side. So, sadly, there those poor people sat, in a filthy, dirty ship. It could have been worse....at least the boat was till afloat! Well, like I said before, I will still cruise. We already have one booked for April. My husband and I are celebrating our 30th wedding anniversary on 4 May, and we felt this would be a great, inexpensive way to celebrate. Where else can you get 5 days of luxury for less than $100 a day? The crew is wonderful, the food is delicious, and I don't even have to lift a finger to cook, clean, or any of that stuff. We've entertained the thought of doing something else, like flying over to Jamaica, or Mexico, or even one of the Sandals resorts. BUT you are talking A LOT more $$$. I know what many of you are thinking. "Sure, it's cheap, but what if you have a 'Triumph' experience?" Well, I say, what if we decided to fly somewhere and the plane falls out of the sky? At any moment a number of things can happen. And, yes, I will still cruise Carnival. WHAT DID I SEND TO MY SOUP PARTNER? "EVERYDAY THERE IS A REASON TO CELEBRATE"